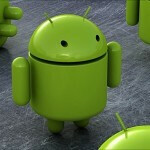 Kantar: Android sizzles in Europe, BlackBerry cools in the U.S. The Kantar WorldPanel market share results for April are in and show that Android was sizzling hot in Europe for the month. Ranging from a pick up of 18.8 percentage points year-over-year in Italy to a 6.2pp gain in Germany, Android controlled the European 5 region (Germany, Great Britain, Italy, Spain and France), with a 69.6% share of the smartphone market. In Spain, Android had a remarkable 92.8% share for April. In the European 5 region, iOS slipped 1.8 percentage points to come away with an 18.4% slice of the smartphone pie. In the U.S., iOS closed the gap a little on Android. In April, the latter had 51.7% of the stateside smartphone market which was up from the 50.3% registered last year. But that gain of 1.4pp was surpassed by the 2.3 percentage point gain made by iOS, which still trails Android in the U.S. with a 41.4% share. Whether it was due to the switch to BlackBerry 10 or for some other reason, the Canadian OEM had a very poor April in the states losing 4.7 percentage points to own a rather small .7% share of the market. Windows Phone, which trailed BlackBerry last year in the U.S., surged ahead with a gain of 1.8pp to control 5.6%. The same action was spotted in Europe and in various other countries where BlackBerry dropped sharply and Windows Phone picked up market share. For example, in those five European countries mentioned above, BlackBerry's slice of the smartphone pie dropped 4.6pp to 2.5% Microsoft's Windows Phone was gathering up those leaving BlackBerry. 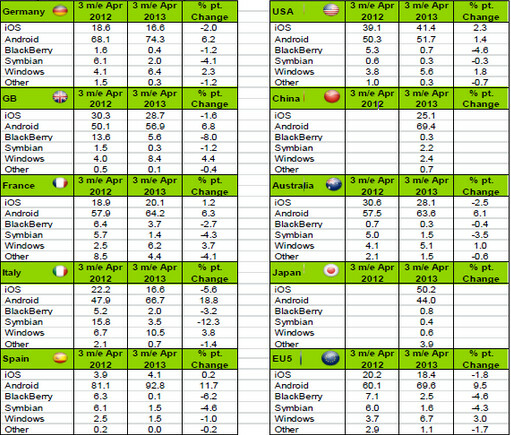 During April, Windows Phone tacked on 3 full percentage points in the European 5 region to control 6.7% of the market. Android ROCKS! Keep it up, BB and WP! Net-net, as BB owners contracts expire, most move on to Android, iOS or WP. It is pretty clear that MS has won the battle for 3rd place. i've seen you on many articles posting negative comments on android and supporting all other os of the world..now you say android rocks? really ? do you do these to get thumbs up? You must be new here, I love Android and I love other OS too, except iOS. I think you're a troll, a new troll. BB & WP are gearing up slowly and steadily. WP yes, BB....I doubt it. Never say never, but I don't see BB picking up steam, good press, or good mojo in the US. They've lost whatever cool they once had, and they lost 1-2 years of momentum getting BB10 to market this late. Nokia/WP is the rising star out of the two. So weird, this Kantar report differs widely from other reports on iOS's market share. Then again, it is just for the month. Either way, nice to know that Android still has growth in the market. I believe its due to the low end Android phones.. I am pretty sure the low end Nokias aren't on sale there, and they are in a tough economy right now. I don't know about all of Spain but in my area (Galicia) people generally have mid to high end Androids. The Galaxy line is especially popular here. With the economic problems most people I know dropped their land lines but have no problem splurging on a good phone. All this chart proves is that the Japanese are not nearly as smart as they get credit for. More likely, their penchant for all things "cute" extends to cell phones. Real story here is WIndows gained for the most part everywhere, iOS lost a lot most everywhere. At these rates.. Windows could be neck and neck with iOS in a year or twos time. Beating Android though would be very very hard.. I would like to see how Android breaks down based on version though.. That might prove to be real interesting. The other thing is the Q10 doesnt seem to be saving BB in countries its on sale in.. thats truly some major BAD NEWS for BB. And the iOS trend depends a lot on what Apple does over the next 18 months, with the iOS 7 redesign and the iPhone 6. If they remain stagnant, iOS will continue to be marginalized. If they change things up a bit and maybe (!!) introduce a larger screen, they'll stay competitive. Agreed on BB though. They're toast. Maybe not this year or next, but sooner than later.